Aitken Spence PLC recently conducted a forum to inspire its top management and sustainability team to explore opportunities in a Green Economy. The event “Going Green: Opportunities for Aitken Spence” was held on the 6th of June, based on the 2012 theme declared by United Nations Environment Program (UNEP) for the World Environment Day – ‘Green Economy: Does it include you?’ The keynote speech for the seminar was addressed by the World Bank Country Director for Sri Lanka – Ms. Diarietou Gaye, who delivered a talk on an apt topic at hand; “Towards a Green Economy: Role of the Corporate Sector”. In her speech, Ms Gaye highlighted the importance of the corporate sector to act as a catalyst driver for alternative and more sustainable ways of doing business in the country to evolve towards a green economy. She stated “If Sri Lanka’s economic growth is to be sustainable; a transition to a green economy seems inevitable. While the government will have to create enabling conditions for green economy and lead by example, the corporate sector has a responsibility to ensure this transition takes place by introducing fundamental changes in how business is conducted”. The UNEP defines the green economy as one that results in improved human well-being and social equity, while significantly reducing environmental risks and ecological scarcities. Suggesting means to achieve this, Ms Gaye stated ““The Sri Lanka Corporate Sector should look beyond the conventional business model and be innovative. Don’t wait for the government to lead the way; you –the private sector – are the engines of growth. Take the initiative to be the engine of green growth”. 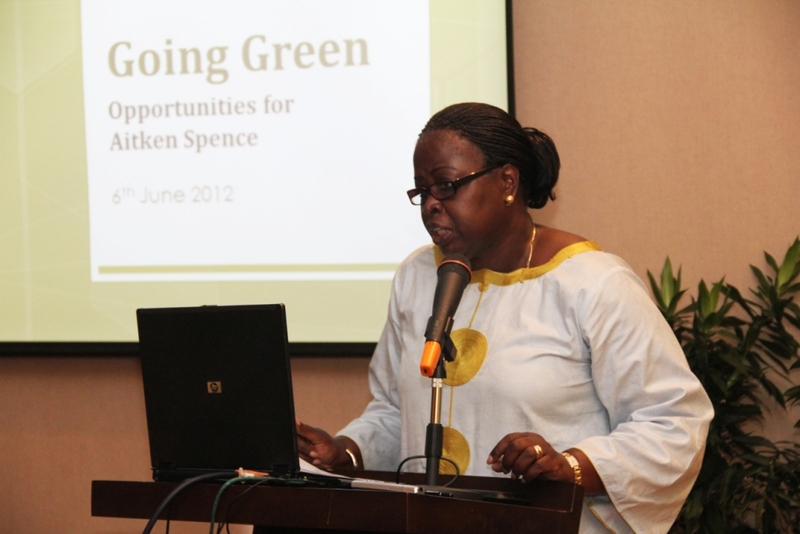 She acknowledged Aitken Spence for its good environmental management, mentioning Heritance Kandalama as a case point, but challenged the Company to do further adding ‘‘Do more, so that you are pioneers in the corporate transition to a green economy”. Ms Gaye concluded her speech by requesting the organization to initiate in accounting for environmental externalities when considering new business developments while exploring alternative sustainable options prior to expansion. Her closing remarks; “This is your opportunity to show that you are shouldering a fair share in Sri Lanka’s transition to a green economy” left the attendees with some powerful thoughts to consider for each of their sectors. Two key case studies of sustainability practices at Aitken Spence were then presented by Mr. Rohitha Rajaratne, Vice President – Engineering, Aitken Spence Hotels; who spoke on ‘Aitken Spence Hotels Adopting Greener Processes’ while Mr. Prasanna Karunathilake, Managing Director, Aitken Spence Printing spoke on ‘ Aitken Spence Printing: Pioneering Green Printing Services in Sri Lanka’. Mr. Rajaratne enlightened the crowd on the measures that Aitken Spence Hotels have taken thus far to improve energy efficiency, conserve water, reduce waste and cut down on carbon footprint by each of the properties in the sector. It was clear from his presentation that each of these measures had not only contributed value but also presented significant financial benefit to the Company, signifying that green economies has much to offer in terms of progress and development. Mr. Karunathilake on the other hand was able to speak on the newly built first green printing facility in Sri Lanka by Aitken Spence Printing. With the world moving towards green investments more positively and proactively, the adoption of such technologies and practices in Sri Lanka was necessary for the future. Taking forward this philosophy Mr. Karunathilake noted that the new printing facility would be the first to receive LEED Gold certification for its adoption of sustainable practices in its operations and technology. The Management of Aitken Spence Shipping convinced their principal Ms. Hyundai Glovis to use the port of Hambanthota as their transshipment hub, due to its many attributes such as location, deep draft and large yard capable of storing over 10,000 vehicles. Hyundai Glovis’s initial plan is for their vessel to discharge 1000 Hyundai vehicles, manufactured at the Hyundai Motors Chennai plant, via the port of Hambantota en route to Europe / Africa and several other destinations, the vehicles will be stored at Hambanthota port’s vehicle yard until the next Hyundai Glovis’s car carrier, “Asian Legend” arrives at Port of Hambanthota on the 17th of June to load these transshipment units. The volume of Hyundai transshipment vehicles via the port of Hambanthota is expected to grow substantially with 3 to 4 vehicle carriers expected to call each month. 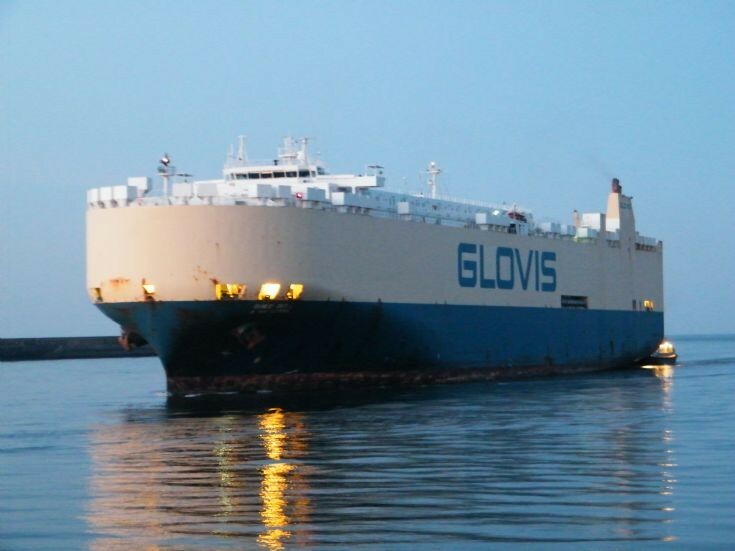 Hyundai Glovis is one of the world’s leading vehicle carriers having a fleet of 30 PCTC vessels serving destinations in North and South America, Europe, Asia, Oceania and Africa. They also offer logistics services and conduct one of the largest vehicle auctions in Korea. This pioneering call of Hyundai Glovis’s vehicle carrier at the MRMR port in Hambanthota will kick-start the operational capabilities of this yet untested port and dispel any myths that it is not a viable port for commercial vessels. The Magam Ruhunpura Mahinda Rajapaksha port is to be one of the leading hub ports in the region, which is becoming a reality with the interest and the potential shown by various Principals.